There are five bedrooms at Star Garden. They all have King Size beds, with one King Size bed being able to split into two single beds. Star Garden is located on the island of St Thomas in the US Virgin Islands in the Caribbean. There are regular flights to St Thomas every day from the USA. 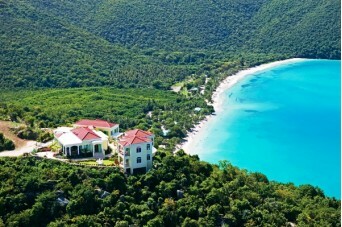 Luxury private villa Star Garden is located on the island of St Thomas in the US Virgin Islands, Caribbean. This recently built luxury estate is located on the highest point of Peterborg Peninsula called Sydney’s Fancy which is an extremely exclusive area offering magnificent views over the green hills, the ocean and surrounding islands. From Star Garden looking West you look down into Magens Bay, to the North you over look Peterborg Peninsula and to nearby Hans Hollick Island. To the East you get a fantastic panoramic view of the British Virgin Islands, St John and neighboring islands. It really does offer some of the best views in the Caribbean. Star Garden’s main pavilion faces east towards Tortola and St John. It has a large room with a big screen television, a fantastic kitchen and a superb stereo system with indoor and outdoor speakers. The dining room offers magnificent views with huge windows surrounding it on three sides. There is a spacious east-facing balcony which offers shade and cool trade winds all day. To the West there is another balcony with rocking chairs which overlooks famous Magens Bay. There is also a hammock to relax in and an outdoor grill. The main pavilion overlooks a stone bordered courtyard and there is a terrace walk way leading to the two separate bedroom pavilions. There is a two story Chateau which has arched passageways and balconies – there are two bedrooms upstairs with ensuites and a master suite on the main level. They are all air-conditioned and have cable TV, with a DVD, VCR and CD player, DSL internet access, mini fridge and coffee service. The master suite has an adjoining room with a kitchenette, study area and love seat. Each bedroom has magnificent ocean views. On the main level, there is also a laundry and exercise rooms. On the other side of the main pavilion is the two bedroom guests cottage which offers a crows nest view down to Magens Bay. These are also air-conditioned and have private ensuites and lovely porches offering fantastic views. Just behind the main pavilion is a 50 foot long pool with a curved infinity edge overlooking Magens Bay. The pool wraps around to meet a large boulder which surrounds a large hot tub which is the ideal spot for watching sunsets over the Bay. Star Garden offers 300 degree views however also ensures your complete privacy. The ground falls away on three sides, making it feel like you are on your own secluded island. This fully equipped spectacular villa really does offer world class luxury so come and enjoy a fantastic vacation on the island of St Thomas! An 8% government tax is not included, and there is also a USD$1000 security bond. Pool, hot tub, movie collection, CD and DVD players, fax machine, hammocks, cable TV, wet bar, exercise room, gas grill, games, music collection, internet, books.